Physician Burnout - too much of a good thing? Physician Burnout and "Good Stress"
"Well, stress can be good sometimes, right?" Its what they are hoping I will say - as if those three letters will make everything better. As if that answer will make burnout go away, so we don't have to talk about it today. Talking about it would make it impossible to ignore. 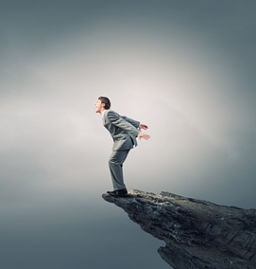 That is uncomfortable when you finally realize you are walking the cliff edge (see below). 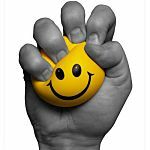 If there is such a thing as "good stress", then what goes wrong when stress gets tipped over into physician burnout? Let's examine the answer to that question in today's blog post. Give a human a task without a deadline or any other form of stress/pressure to perform and they will check out, dawdle and get bored. The project will sit in a pile on their desk. You have to push - apply a certain quantum of stress - to get them to move. Give a human a haystack of complex tasks, sprinkled generously with meaningless busywork, supply them with dull and ineffective tools and impossible deadlines (feel familiar?) and they collapse in a heap. 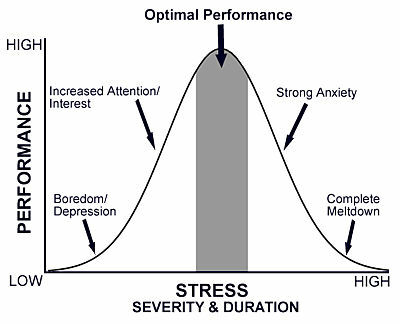 Where is the Goldilocks here ... the sweet spot of "good stress"? In this graph, Goldilocks is the grey zone. You know this "just right" level of stress if you have ever tried to get your 6 year old to clean their room. You have to get their attention and give them some kind of kid-level incentive to help them focus on the task. If you get mad when they stay rooted to the video game, go over the top - yell and scream and throw things (not recommended) they run away crying and the room is still a mess. So ... yes there is "good stress". It is just that physicians rarely inhabit that good stress zone. The last time you were in that "not enough stress" situation was in the month before graduation from your senior year of HighSchool or on day seven of your last two week vacation. Many physicians are walking the cliff edge on the high side of this curve. Here's the way I see it with my physician burnout coaching clients. On anything but the most mellow of days, a solid 30-40% of physicians are in the yellow and red zone for at least a couple of hours in their practice. 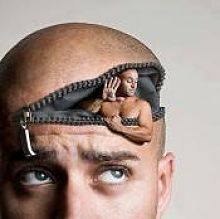 This is not good stress. You are flirting with overwhelm. Here is a familiar rating scale that will make this easier. Take a look below and pick the face that best represents your most difficult day in the week just past. You can see where the yellow and red stress levels sit from a different perspective. 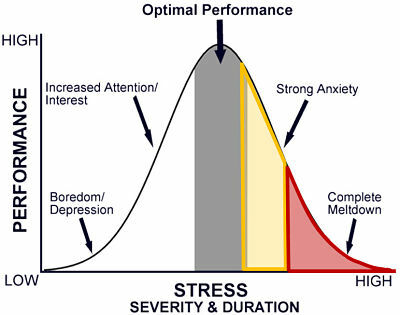 The downward spiral of physician burnout begins when you spend too many days in the yellow and red stress zones. Unless you are very skilled at recharging in your time off, your Energetic Bank Accounts become drained. You are running on fumes, just hanging on from day to day. How can you pull up out of the downward spiral and get back to the Goldilocks scenario? The steps are simple. Notice the frequency of yellow and red stress days at work. Notice your physical, emotional and spiritual energy levels. Don't judge. Just notice. If you are tapped out and below empty, recovery can only start when you admit it and commit to change. Don't continue to fall victim to your workaholic, superhero programming and just keep soldiering on. Einstein used that behavior as the foundation for his insanity definition. Get crystal clear on your Ideal Job Description. Use your team. Ask for their help. Find some wiggle room in your schedule. Use Batch Processing and the BID huddle. Don't let that little voice tell you if you were stronger or worked harder or had more of the right stuff ... this wouldn't be happening. That is just the head trash of your programming. You learned to think that under the stress of your training. In reality, you are human. Yep. Deep down under the layers of that white coat and the letters after your name sits the same flesh and blood as your patients. You have finite limits. When it comes to caring, empathy and helping others, "You can't give what you aint got". All of this is possible, even if you have never done any of them before. 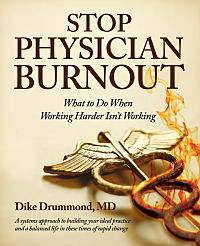 CLICK HERE to learn more and get your personal copy of "Stop Physician Burnout - what to do when working harder isn't working"